Optical frequency combs are widely-used, high-precision tools for measuring and detecting different frequencies — a.k.a. colors — of light. Unlike conventional lasers, which emit a single frequency, these lasers emit multiple frequencies simultaneously. The equally spaced frequencies resemble the teeth of a comb. Optical frequency combs are used for everything from measuring the fingerprints of specific molecules to detecting distant exoplanets. 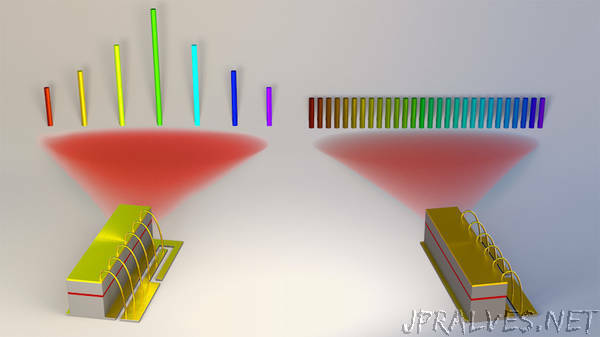 Now, researchers at the Harvard John A. Paulson School of Engineering and Applied Sciences (SEAS) are exploring the possibility of using an infrared frequency comb to generate elusive terahertz frequencies. These frequencies — which lie in the electromagnetic spectrum between radio waves and infrared light — have long promised to transform communications and sensing but are very challenging to source. By harnessing a recently discovered laser state, SEAS researchers have discovered an infrared frequency comb in a quantum cascade laser that offers a new way to generate terahertz frequencies. Dubbed a harmonic frequency comb, this new system produces a spectrum of teeth with spacing tens of times larger than traditional frequency combs. The large but precise spacing allows these modes of light to beat together to produce extremely pure terahertz tones. In traditional frequency combs, teeth are separated by a small frequency dictated by the characteristic length of the laser cavity — meaning teeth sit close together. The harmonic frequency comb, however, can use a larger multiple of that frequency. “With this new comb regime we can bypass the strict limitations set by the cavity length and reach an unprecedented degree of flexibility in the realm of quantum cascade laser frequency combs,” said Marco Piccardo, a postdoctoral fellow in the Capasso lab and co-first author of the paper. Key to the research was proving that these largely-spaced teeth were indeed equidistant. Using another reference comb, the team was able to study the harmonic frequency comb spectrum at very high resolution. Most current terahertz generators use large, complex optical systems operating at very low temperatures to produce terahertz frequencies. The harmonic frequency comb operates at room temperature, uses commercial quantum cascade lasers, and is self-starting, meaning that the laser can automatically switch to this regime when electrical current is injected into the device.